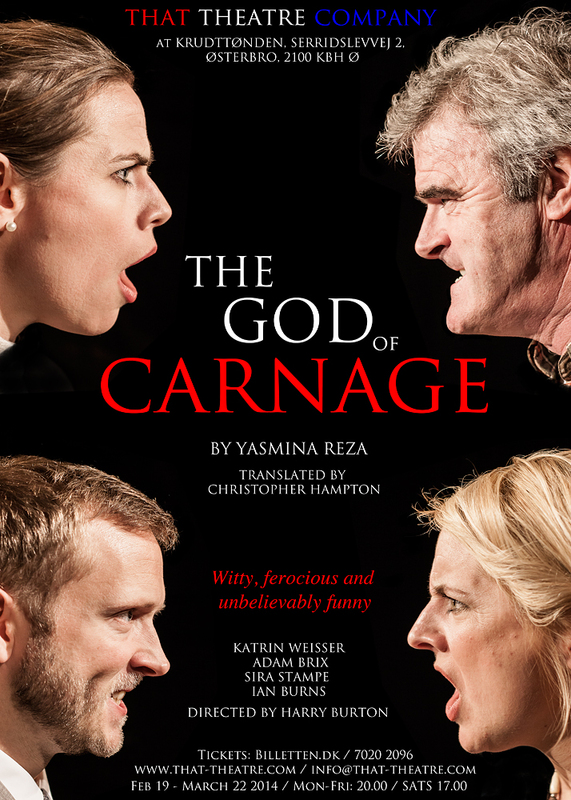 I recently shot promo images of ‘The God of Carnage’, the new stage production by That Theatre Company. On the shoot, I got a sneak preview of some of the scenes and lines, and I had already seen the Hollywood movie adaptation a couple of years ago. But nothing quite prepared me for last night, when I watched Ian Burns, Sira Stampe, Adam Brix and Katrin Weisser perform this explosive play in full. Over the course of one scene of 80 minutes in the perfect intimate setting of the Krudttønden stage, the four characters unravelled before our eyes in dramatic and hilarious fashion, switching allegiances, exposing their flaws….and making quite a mess. I won’t spoil things by explaining what the hamster is about. Or the tulips. Just go and watch the drama unfold! It’s a modern classic, performed brilliantly. Darkly comic and brilliant fun. Don’t miss it! Photography and poster design by Sarah Coghill.